The basic function of lateral link is to help control the wanted force under acceleration and braking. For example Godspeed’s pillow ball lateral links are design to lock in traction while drifting. Additionally you will experience improved stability during acceleration under high speed cornering. 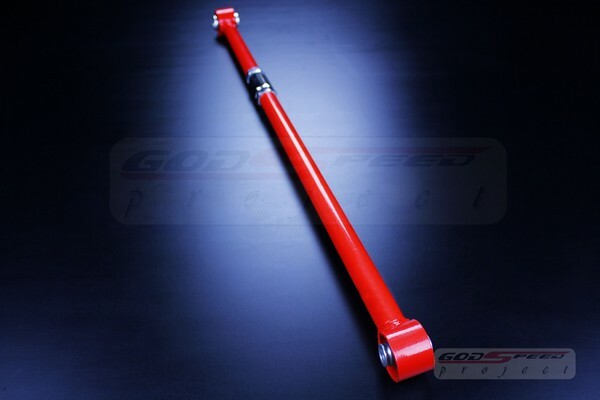 Godspeed lateral arms improve handling for the Toyota AE86. This lateral rod will replace the OEM bars and the soft rubber bushing. All the piece are made of high-strength steel alloy. Additionally Godspeed lateral rod end use pillow ball constructed for comfortable ride yet maintain good performance compare to stock rubber mount will which wear out in couple years. A godspeed pillow ball lateral link will last you at least 10+ years. Finally these lateral arms will easily out perform the stock units. Adjustable lengths will allow more fine and precise tuning of suspension geometry.